Is this a happy bird? No, she is one of our Mexican dancers! St. Genevieve Historical Society displays pictures of our most recent project: the restoration of the old St. Genevieve’s high altar. “The Coffee Shop”. A group of ladies serve delicious pastries, cakes, coffee and tea. Volunteers at the Gordita booth work hard for hours preparing this traditional food. Happy people preparing enchiladas. Do you want one? Red or green? With an egg on the top? Musicians of a mariachi band provide entertainment. What about a little spider on the cheek? 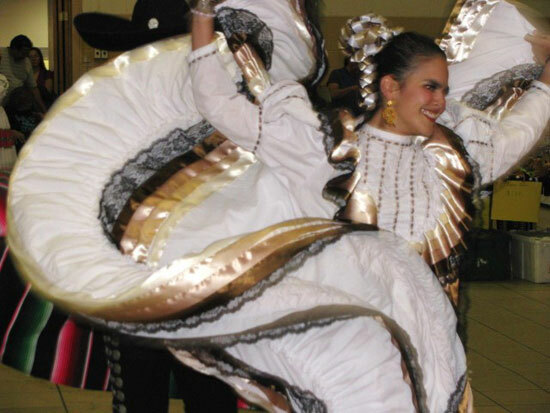 “Ballet Folklorico” performs beautiful traditional dances. Lot of people. Lots of fun. Our Fiesta is not only a fundraiser, it’s above all an opportunity to meet friends and celebrate as a Christian community. Visitors enjoy looking at the exhibits. “Rival Cheer” brings to the Fiesta a lot of enthusiasm. The Fiesta celebrates diversity and provides entertainment for all. The NMSU Gospel Choir enhances our annual celebration.